This 4 piece band from West Virginia – who boast having turned the head of Lamb of God’s Chris Adler after the release of their self-financed debut – have been labelled everything from thrash to progressive metal to groove metal but most importantly they’ve continuously upped the ante on complexity and sophistication during their 5 album lifespan. So, as we approach the release of their rather swish-sounding sixth opus, The Cicada Tree, we wonder why Byzantine aren’t a household name (in the metal community anyway)? Well, founder member Chris Ojeda shares a trait with many visionary frontmen in that he finds it somewhat difficult to maintain a steady lineup; Byzantine have already called it quits once in 2008 before reconvening a couple of years later. Lets face it, instability can be the enemy of a common goal while being a touring musician in a band with Byzantine’s commercial trajectory really doesn’t pay that well these days either! Anyway, we digress. Whatever your reason for possibly not being familiar with these boys, it’s time to rectify that situation with The Cicada Tree, an album that bears out this band’s reputation for consistency and plays to most of their strengths (and the odd weaknesses). Straight away, Byzantine exude the clinical songwriting approach of classic era Big 4 thrash, where the ‘meticulously designed riff’ was lord and a song sank or swam on it’s merits! Two tracks in and Byzantine drop their first stone cold riff of doom on “Vile Maxim”. That’s world class groovery right there! 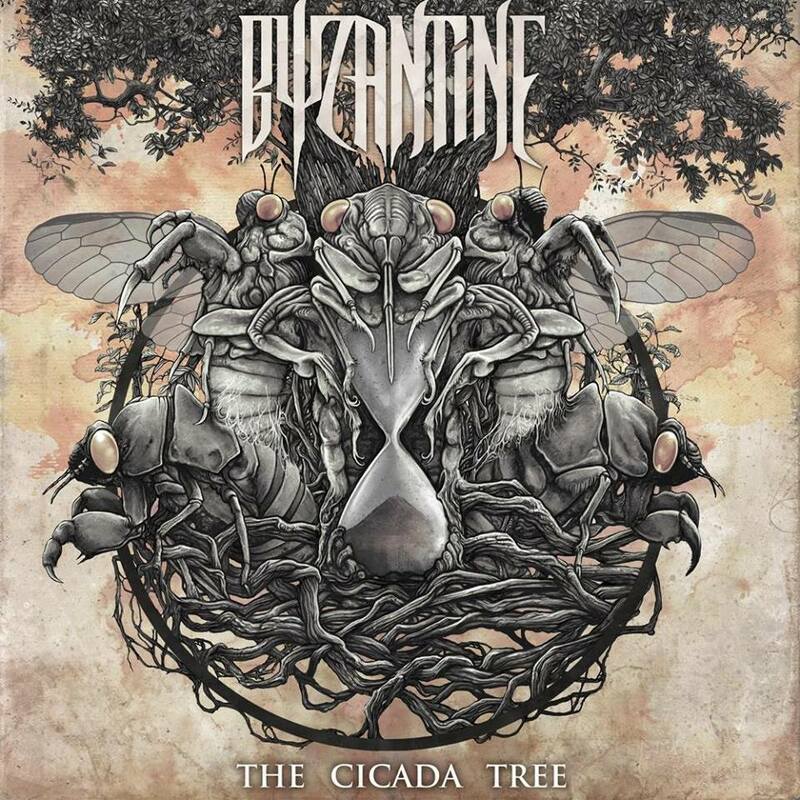 The Cicada Tree appears to be business as usual for Byzantine but with an emphasis on melodic breakdowns and overwrought vocal lines. This pattern begins with “Map of the Creator” but doesn’t end there. While some may decry a metal band going this far down the Five Finger Death Punch road to mainstream yell-alongs, you can’t deny that Chris Ojeda has a great voice (in any register) and on “Dead As Autumn” an almost Miles Kennedy-sized vocal glissando is smashed out the park! Of course, your approval of this will depend on how ‘heavy’ you take your metal. Byzantine’s musical chops and breadth of palette are beyond reproach but for us, Ojeda sounds so good in the growled register that we almost wish the band would stay there and skip over a few of the angsty sounding clean vocal sections. We would never criticise a man (or woman) for wanting to utilise a vocal style other than gruff-as-hell but Byzantine simply sound cooler and harder when they are dropping the heavy. In many ways, The Cicada Tree is at the perfect calling card for modern metal. It has enough trad metal pomp and ceremony to keep the traditionalists happy but enough aggression and big hooks for the younger audience. While it’s beautiful and multifaceted, accessible to both the weathered metal-head and casual rock fan alike, there are occasions when it walks the precarious tightrope between cool and mawkish.